For the groove machining of cast iron pulleys, NTK has now introduced its exciting line of POLY-V grooving tools. By developing grooving inserts in its renowned HW2 insert grade, NTK is offering a solution that can reduce machining times, improve productivity and tool life. 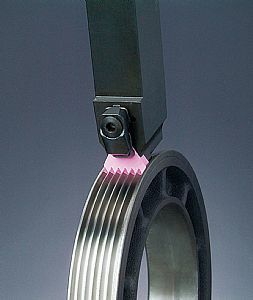 The impressive new line from NTK is available with insert geometries that provide 3, 4, 5 and 6 grooves respectively to suit the dimensions of the desired pulley. To enhance the strength of these insert geometries, the tooling line is supported with K3-C, K4-C, K5-C and K6-C designated shims that underpin and support the inserts. To further extend the tool life and performance, the inserts are particularly thick at 4.76mm. The shape of the new POLY-V inserts include either a 0.3, 0.4 or 0.5mm edge radius with a standard pitch offering of 3.56mm with a groove depth of 3.35mm. These dimensions have been selected to conform to the industry standard forms for pulleys. 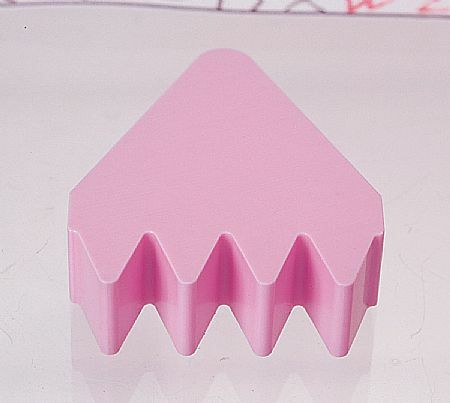 However, NTK can manufacture specific geometries to suit the needs of the end user. The impressive new POLY-V line provides machining parameters beyond alternate products with a recommended cutting speed in the region of 300 to 600m/min and a feed rate from 0.05 to 0.15mm/tooth that depends upon the performance parameters of the customer machine tool. This exceptional cutting rate on cast iron is enhanced by the supporting toolholder that is particularly robust and rigid. 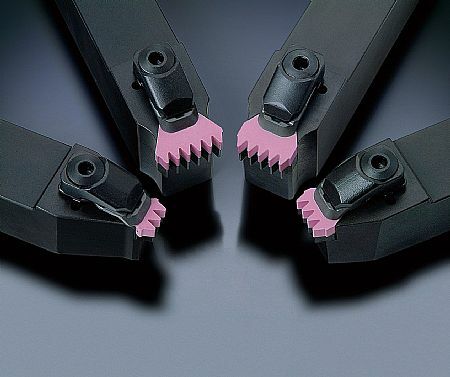 The POLY-V is supported by a choice of toolholders that have square shanks with a height of 25 or 32mm and a width of 25mm that enhances the insert clamping, vibration damping, surface finishes and rigidity characteristics of the tooling. The toolholders are provided with either an 150 or 170mm overall length. For fast insert changeovers and to minimise non-cutting times , the POLY-V line includes a thrust plate, clamp, shim and shim-screw that efficiently and rapidly clamps the insert with extreme force to guarantee impeccable surface finishes on the pulley.